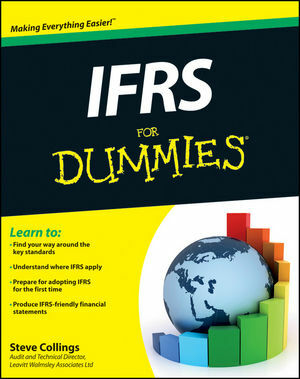 IFRS For Dummies is your complete introduction to IFRS and international accounting and balancing standards. Combining all the facts needed to understand this complex subject with useful examples, this easy-to-read guide will have you on top of IFRS in no time. In plain English, it helps you make sense of IFRS and your understanding of: what they are and where they apply; how to adopt IFRS for the first time; how IFRS affects the key components of your financial statements; how to disclose information in financial statements; and much more. If you're an accountant, student, or trainee in need of accessible information on IFRS, this hands-on, friendly guide has you covered. Steve Collings is Audit and Technical Director for Leavitt Walmsley Associates Ltd. Steve has written extensively for AccountingWEB.co.uk and is the author of Interpretation and Application of International Standards on Auditing, also published by Wiley. In 2011, Steve was named Accounting Technician of the Year at the British Accountancy Awards.